Offering a turbocharged 1.5L ECOTEC engine with proven fuel-saving technology like Variable Valve Timing, Direct Injection, and Automatic Stop/Start, Malibu delivers a sporty and responsive ride along with an impressive 37 MPG highway. Pairing a turbocharged, 250-horsepower 2.0L ECOTEC engine with an 8-speed automatic transmission, Malibu Premier offers exhilarating performance to match its stunning good looks. 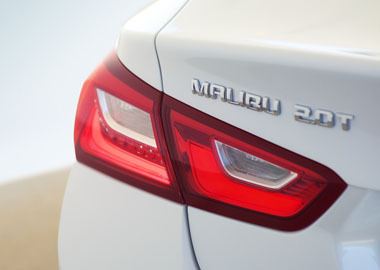 LED taillamps give the all-new 2016 Malibu Premier a sleek and modern look. 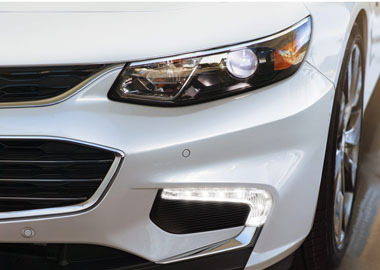 Stylish available LED daytime running lamps will turn heads and help improve visibility. Malibu has a spacious interior carefully tailored to the needs of you and your passengers. An intuitive center console puts controls where you need them, while built-in USB ports and an available Wireless Charging station offer plenty of options for keeping your devices compatible connected and charged. Malibu is the first vehicle in the industry to offer a built-in system to help encourage safe driving habits and let parents know how their teenager drove the vehicle. By inputting a PIN into your Chevrolet MyLink display, available Teen Driver technology can enable a whole host of features. With an intuitive and customizable Chevrolet MyLink display with support for Apple CarPlay™ and Android Auto™ and an available built-in 4G LTE Wi-Fi® connection, Malibu helps keep you connected to the entertainment you love and the information you need. Malibu is the first car in its class to offer available built-in 4G LTE Wi-Fi® giving you and your passengers a stronger, more reliable way to connect up to seven devices to the Internet via available Wi-Fi®. Available active safety technologies like Low Speed Front Automatic Braking and Lane Keep Assist work with you to help prevent accidents before they happen. In the event of a collision, Malibu features 10 standard air bags and a high-strength steel safety cage to help protect you, and offers OnStar† Automaic Crash Response to contact emergency services on your behalf. Malibu comes standard with 10 air bags and an innovative 360-degree sensor that can measure the severity of an impact and adjust the inflation of the air bags accordingly. In the event of an impact, a high-strength steel safety cage provides impressive protection. 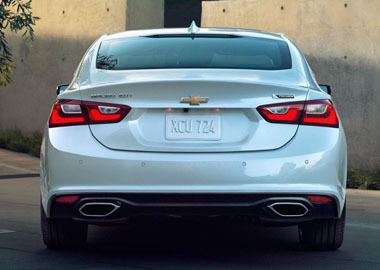 When the air bags deploy, built-in sensors can automatically alert an OnStar Advisor (if equipped), who is connected to your Malibu, to see if you need help and will contact emergency services. Even if you don’t respond, an OnStar Advisor can use GPS technology to pinpoint your location and request that emergency help is sent right away.